There will be no February report due to construction at the nature centre. Thursday, January 27: The Black-legged Kittiwake was seen both this morning and in the afternoon at Lakeview Marina. Neither the eider or scoter were reported. Below is a photo from yesterday by Tom Preney. Wednesday, January 26: The Black-legged Kittiwake continues to be seen. Yesterday it was spotted from Lakeview Marina and this afternoon it was seen by Tom Preney at Sandpoint Beach (about 1 km east). 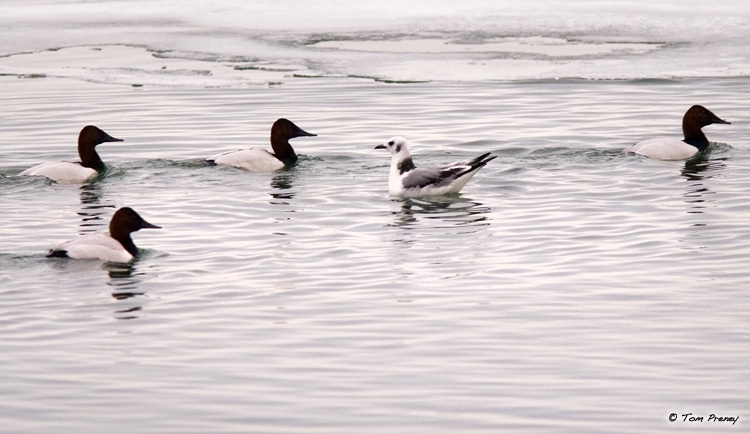 Monday, January 24: Karen Cedar saw the King Eider and White-winged Scoter at Lakeview Marina in the morning and Len Jones discovered an immature Black-legged Kittiwake at the marina in the afternoon. There are still very large numbers of waterfowl present in the area. Saturday, January 22:The first stop of today's field trip was Lakeview Marina. The open water around Peche Island held thousands of waterfowl (16 species) and 6 Great Blue Herons, 1 Lesser Black-backed Gull, 3 Glaucous Gulls, 11 Bald Eagles and a Peregrine Falcon. A female King Eider and male White-winged Scoter were seen close to shore just downstream from the marina. A male Belted Kingfisher was present along Little River by the outflow of the pollution control plant. Lakeview Marina is located on Riverside Drive at the eastern edge of Windsor opposite Peche Island. Another good lookout for waterfowl today was the public beach about 1 km east of the marina. 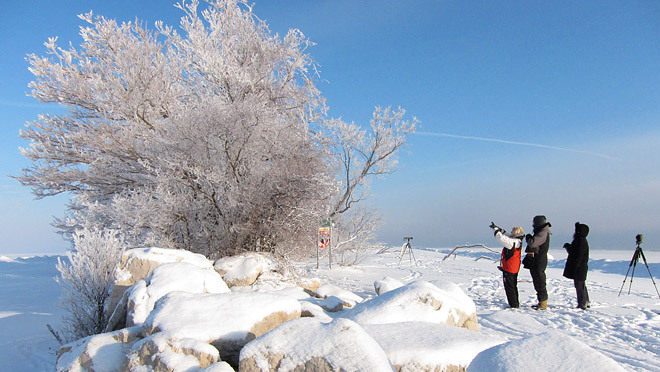 Saturday, January 8: We had a beautiful winter day for our birding field trip to Point Pelee (see above photo). Highlight of the day was the large number of Bald Eagles concentrated along the east beach of the park. At one point we counted 14 eagles perched along the shoreline or flying over patches of open water! It was an excellent day for raptors which included both light phase and dark phase Rough-legged Hawks and an adult Red-shouldered Hawk. A Silver-haired Bat was discovered on the side of the washroom building at the tip. 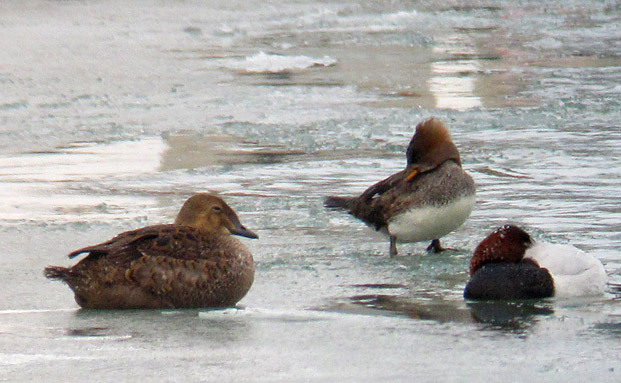 Saturday, January 1: The Detroit River Christmas Bird Count was held today. We had good numbers of waterfowl this year including a Northern PintailXMallard, 2 American Wigeon, over 4,000 Canvasbacks, 3 Surf Scoters and 4 Long-tailed Ducks. The Ojibway Complex of parks and nature reserves tallied 4 Northern Mockingbirds, 23 Tufted Titmice, 10 Carolina Wrens, 7 Eastern Bluebirds and 41 American Robins. Complete results are in Detroit River CBC.pdf.